For me, 2013 has been a wonderful year. Now, I'm not saying it has been nothing but a bowl full of cherries. But you have to take the bad with the good, keep a stiff upper lip, and focus on things you can affect. Below, you'll find my most popular posts of this year. I want to thank you for allowing me to interrupt periodically with a few thoughts and ramblings. Lest you think otherwise, I write these posts for me. When it comes to leadership and management, I am no doctor. I remain a patient, through and through. Extreme Member Service, With a Giraffe. 20 Years Late: Thank You. Don't Make These Mistakes When Dealing with Problems. Now, if it's all right with you, we'll part ways until the New Year. With that in mind, have a wonderful holiday season, everyone. Here are a few items that caught my eye. Enjoy, and have a wonderful weekend. As we inch closer to the end of the year, it is natural to reflect on the year that was with an eye to improving things in 2014. There's no free lunch. If you want to change something, you'll have to...well, change something. That means something has to give. There are only so many hours in the day. If you want to improve some facet of your life, the investment in time, energy and focus has to come from some place else. There's no substitute for hard work. Seinfeld is funny. So that must be why he's successful, right? Perhaps to a point. But he works hard. Behind every successful person, you'll see a ton of hard, focused work. Nearly everything I see and read backs this up. Nearly everything. If you're looking for a silver bullet or secret to success, stop looking. And start working. Watch out for vampires. There's a good deal of negative energy out there. Stay clear of it. And beware of those that feed off of negative energy. Seth Godin does a wonderful job of highlighting this trend. He calls these folks "vampires." 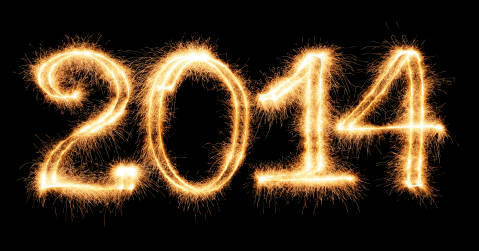 Vampires will not help you improve in 2014. In his words: "It's so tempting to evangelize to the vampires, to prove them wrong, to help them see how destructive they are. This is food for them, merely encouragement. Shun the ones who feed on your failures." Learn. Never stop learning. My pal John Spence sums it up in this blog video called Personal Kaizen. Life-long learning is the key to personal success and happiness. The more I learn, the more I understand. And that understanding allows me to connect dots and see patterns. Read. If you learn about successful people, you'll find that they read. A ton. This is akin to life-long learning. Carve out more time in 2014 to read. You won't be sorry that you did. Simplify. Is your life too busy? Too many things going on? Fix that. Remember, it is your life. You're in control. The President focuses on simplifying his life. The busier you are, the more important this is. Simplification reduces stress, increases your attention, and frees up time to work on your priorities. Don't know where to start? Here's one of many articles that talks about how to de-clutter your life. Health. I'm not telling you to focus on your health in 2014. But I'll say this. When your health is going well, everything else seems to go a bit better as well. It is a sort of a life "springboard." Don't have time? Really? Block out the noise. There's so much noise out there. Social media. The radio. The television. Advertisements. How much of it really affects you and what is important to you? Very little. The more you can block out the noise, the better. Barry Ritholtz of The Big Picture wrote a wonderful piece on how to cut down on the noise in your life. Focus where you make a difference. Akin to blocking out the noise, is the need to focus on where you can make a difference. During the last presidential election, at times I had to laugh. Some people looked at the election as if it would have a major impact on their day-to-day life. Now, I'm not saying that it wasn't important. But become informed, and then vote. Then move on. There are a number of things you can control in your own life that will determine your success. More than who lives at 1600 Pennsylvania Avenue in D.C.
Focus on what you're doing now. We've become a distracted society. Between Facebook, Twitter, Smartphones, television, Netflix, and iPads, it is harder to find folks who are focused on what they are doing and who they are with. Their eyes always seem to be focused on the next thing, and then quickly on to the next thing after that. We've become a society of multi-taskers. I've found that people who are great at getting things done have a master plan, but they focus on the task at hand. Completely. None of these ideas are resolutions. But I hope some of these thoughts will help you succeed in 2014, whatever success means to you. Happy hunting, everyone. Do you like spending more money than you have to? I didn't think so. With that in mind, if you know you're coming to a NAFCU conference in 2014, please use the code HOLIDAY by January 10 when you register. You'll save $100. We Look, But What Are We Really Seeing? If you manage people, you'll need to check in on things from time to time. But a recent study raises an interesting question. Whatever you see, is it real? And, even more importantly, is it even helping? In short, a study in a Chinese factory found that workers tend to innovate and share ideas less when they are watched by management. When managers were near, workers reverted to the "company line," and work overall became less efficient. An additional study found that employees behind curtains, who felt a sense of privacy, saw their productivity soar. "We assume that when we can see something, we understand it better," Bernstein says. "In this particular environment, and perhaps many others, what managers were seeing wasn't real. It was a show being put on for an audience. When the audience was gone, the real show went on, and that show was more productive." Like nearly everything else, you need to take the study with a grain of salt. A world without supervision or oversight? Heavens no. But it does remind us of a basic human need. Privacy and ownership. At some level, all of us want to be left to do our work. To tinker and improve. As always, it seems, the trick is in finding the right balance. I will never be able to properly repay all the prayers and kind words I received regarding my older brother and his surgery. All went well, and my brother was on his feet less than 12 hours after his surgery ended. The day was long and stressful, but I carried your thoughts, words and prayers with me. They gave me peace and strength. And both were needed. As managers and leaders, you will work with people. People who have brothers and sisters. People who have pets. People who have spouses. Parents and grandparents. People like me. I found out that my brother has to have open-heart surgery this week. He's my big brother. He's too young for this. He has two wonderful sons, and the nicest wife anyone could want. His condition weighs on my heart and mind. People like my wife's friend, who found out in one day that her mother has cancer and that her husband lost a job that provided for their family. My wife's friend will not be having a good day today. Neither will I. It's just not going to happen. The world is wonderful, but it can be an outright bummer sometimes as well. The downside affects people, some of whom work with you. I've said it before, and I'll say it again. You measure a person not in the moment, but through the seasons. So, the next time you see someone not on their A-game, relax. Their mind might be with their big brother. Last evening, I had the pleasure of dining with a number of successful credit union CEOs. As much as I could, I sat back and listened. What really is your job? The question really seem to hit home, and one-by-one, all the CEO took a minute and discussed how they saw their work. No one gave exactly the same answer, but they all spoke about similar things. Focus. They spent time and effort making sure their teams focused on what mattered most. One CEO said that when she started, she boiled the list of things to focus on down to only three. If what you were doing didn't fit into one of the three things, you stopped doing it. Now that's focus. Strategy. Each CEO said that they had to build a strategic vision. Some worked with their boards. Others were delegated with that task. Communication. This was universal. Every CEO said that much of their job was continuous communication - both giving information and listening. Communicate the vision. The strategic plan. Priorities. Over and over. And all of them championed the idea that good leaders had to get out of their office and visit with their colleagues. Shepherding. If the credit union, or a particular executive was getting away from priorities, each CEO said a good part of their job was diplomatically getting things back on track. Stewardship. Finally, each CEO spoke of stewardship. Protecting and empowering employees. The credit union's brand. The credit union's membership. Its vision. You could see the ownership and care that each leader had in his or her voice. That's a good list. And it was a great dinner. And the food wasn't bad either. Black Friday. Holiday Cards. To-Do Lists that are longer than Santa's "Naughty" list. This year's Christmas shopping season started before most turkeys were carved. Somehow, a time that should be filled with family, friends and peace now has become a pressure cooker. And should that be a surprise? Ask anyone how they're doing, and they'll tell you. When I hear that phrase, I'm not sure if the person is complaining or boasting. In today's world, if you aren't busy...something must be wrong. He continues, extolling the virtues of....it can't be so...idleness. Now, don't get me wrong. I'm all for hard work. But I agree with Kreider that you need to give yourself some white space. And if you find yourself with a few free minutes every now and then, it isn't the end of the world. And speaking of white space, here are a few shots of my Thanksgiving vacation with my brother and his family. Zion National Park, at sunset. We weren't the only ones enjoying the view at the Grand Canyon! Really? Why would he do that?